Moving a faculty account from one primary unit to another primary unit is possible but there are things to consider when making that move. Ask yourself: Do both units have the same configuration with regard to sections and fields? Example 1: Faculty A is moved from unit 1 to unit 2. Unit 1 has 10 sections that are the same across the institution but unit 1 also has 2 section specific to that unit. Unit B just has the 10 sections that are shared across the institution. In this scenario, the faculty member just has two new sections to complete for his/her new unit. Example 2: Faculty A is moved from unit 2 to unit 1. Unit 2 does not have the two additional sections that Unit 1 has so what is the faculty member's options for keeping/moving the data in the two sections? In this scenario - a decision should be made and the faculty member notified about the consequences of this move. 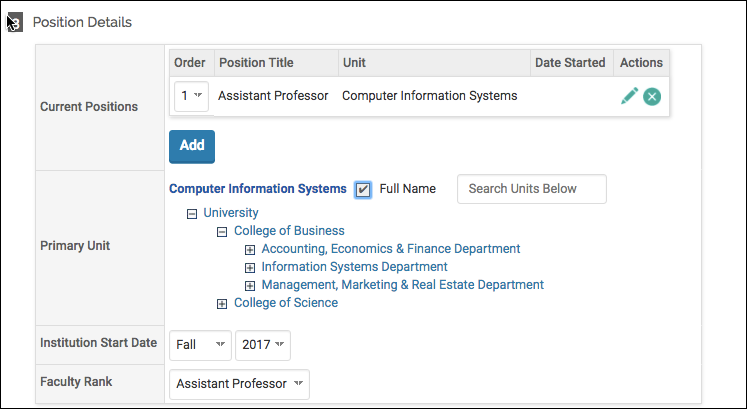 And for clarification, the data in the two sections still exist in the database, it is just no longer shown (viewable/accessible) to the faculty member. 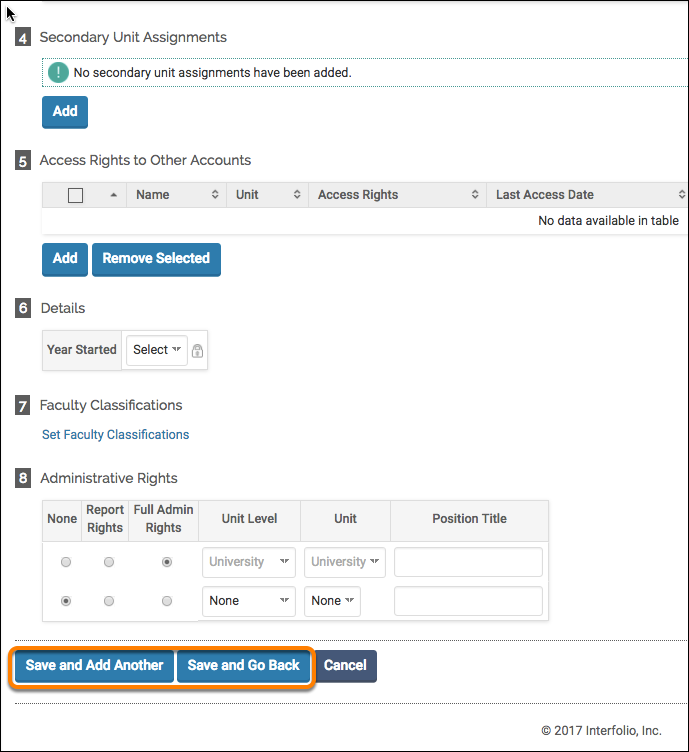 Moving faculty members will remove the faculty member's access to relevant data if they are being moved from a unit (or parent units) with configured activity classifications or customized sections on the input forms or Vitas that customized/created in units that the faculty will no longer be associated with. One of the ways to alleviate this is to secondarily assign the faculty to the original unit they were moved from. Note: This can be temporary, allowing the faculty member time to copy any relevant information to other sections. The key is to look at the current unit vs the new unit and identify any units they will no longer be associated with (hierarchically). Then, examine any custom sections, input forms, activity classifications or vitas that may exist in those units. 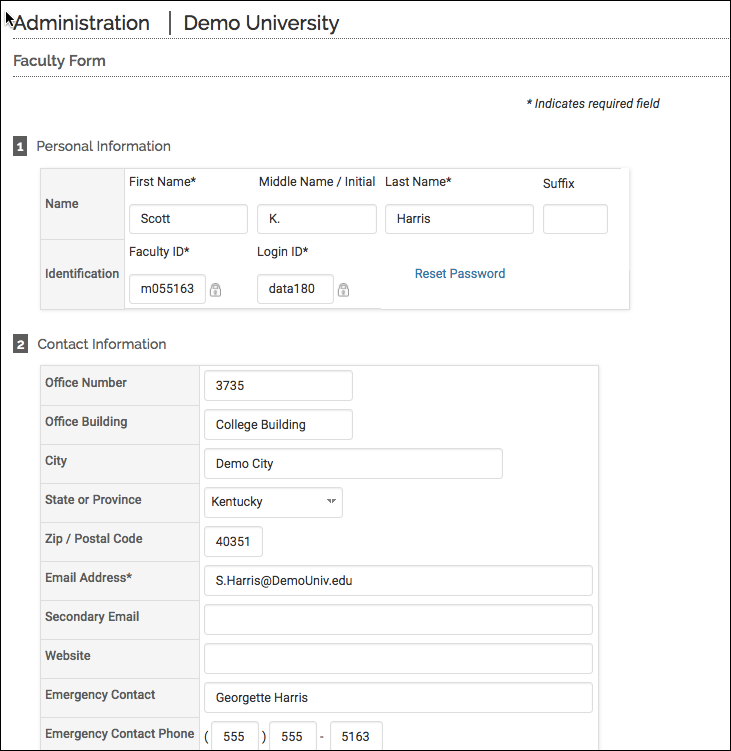 To move a faculty's account primary unit, you must have the proper administrative privileges. After selecting the Edit Pencil icon, the following faculty form page will be displayed. The primary unit will now appear with the new unit, but now you must save to enable the change. If you do not save than the unit will not be changed.